In this tapestry "The Bedroom - Van Gogh" we see the famous bedroom of Van Gogh from 1888. Also known as the Bedroom in Arles, Van Gogh's own title for his work was simply The Bedroom. It is in fact bedroom 2 , place Lamartine in Arles, France known as the yellow room. The room was trapezoid not rectangular and this may be seen by some, if they were aware of this. There were 3 versions created by Van Gogh, each with a slightly different color palette. Here we see the textures and tones of the room including the textured floor, the cushions of the chairs and the wood of the bed. 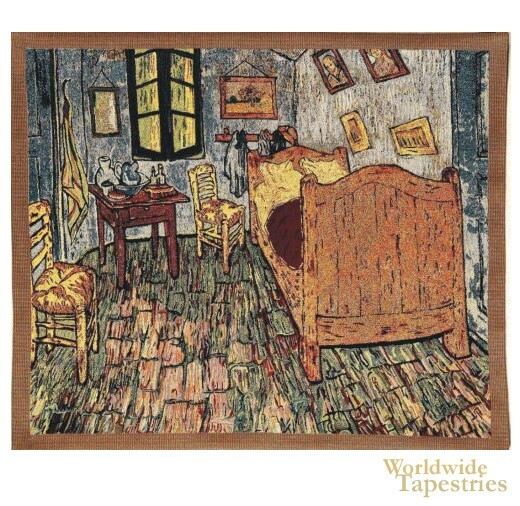 This fine art tapestry "The Bedroom - Van Gogh" is backed with a lining and has a tunnel for easy hanging.